Greetings from beyond the veil, ghostly and ghastly types. Matthew Dawkins here. 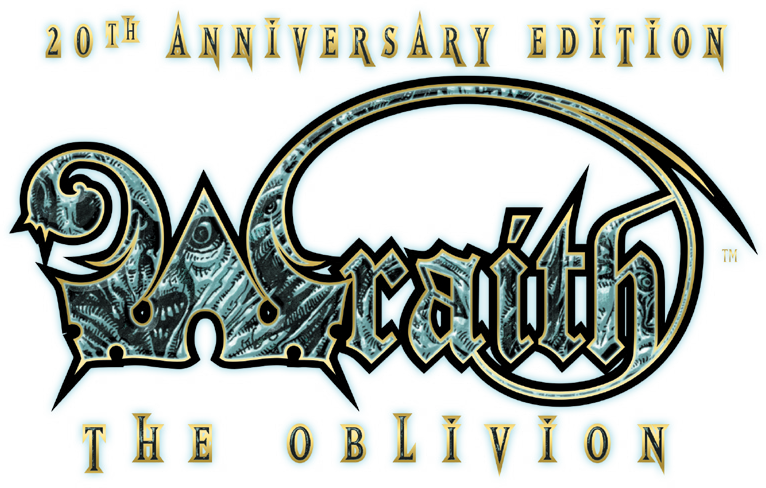 Anyone who’s been tracking the development of Wraith: The Oblivion 20th Anniversary Edition will be aware a certain curse afflicted the book repeatedly in the run up to its release. Thankfully (and tempting fate now) we seem to have bypassed the curse in errata phase, as that’s now complete. I thumb my nose at the curse, knowing it holds no power over me! What’s the worst that can happen? At any rate, amended, removed, and added text is being worked on by Aileen, who’s handling any layout adjustments. I understand she’s getting through this at a fair click. 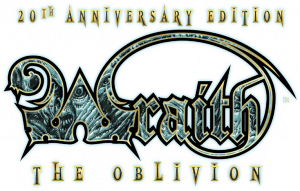 If you check out the Onyx Path Forums, you’ll see Wraith accumulated a decent amount of errata, fairly standard for a book its size. Some of the posts focused on grammatical corrections, others on content or system that held inconsistencies across chapters, and some — likely the most important of all — mentioned the absence of Lifesight, Deathsight, Heightened Senses, and Insubstantiality in the book. At the time these basic wraith abilities were omitted for space, but on discussion, we’ve decided to include them in the core book. We’ve been able to include them without seriously adjusting words, art, and layout around them (always an issue when inserting big blocks of text at this stage), so celebrations all around! But here’s a thing I’ll give you right now. Some of you may already be running or playing Wraith without these abilities, so rather than wait for the errata’d book to reach you, here’s the text for each of these powers. Feel free to incorporate them into your game, and see you soon with an amended PDF! Lifesight is the ability common to all wraiths to see the life force still extant within a living being. This manifests to a wraith’s eye as an aura, with the color and strength of the aura relating to the subject’s mood and health. If a wraith wants to try reading the aura, the roll is Perception + Empathy, difficulty 5. The greater the number of successes, the deeper the wraith’s understanding of the target’s current health, mood, and state of mind. One success gets a general sense for how the mortal is feeling, while four is practically reading their mind. Deathsight lets wraiths view the Oblivion within all things. Objects and individuals appear not as they are but as they will be, gaunt and decayed. However, wraiths can use Deathsight to measure the amount of Oblivion in something. This enables a wraith to spot weak points or determine how much health a living being has. To exercise Deathsight in this fashion and either Discern Weakness or Sense Health, the wraith rolls Perception + Awareness, difficulty 5. The number of successes indicates the detail the wraith is able to observe. One success might let a wraith know that a mortal is ill, while four successes pinpoints a yet-undiscovered tumor that’s sapping their life. A weak spot identified through Deathsight, be it on a building or a person, offers a -1 difficulty to hit. Wraiths are unusually well attuned to the world. They hear more clearly, see more sharply and sense more accurately the state of the world around them than the living. That makes them good at overhearing whispers, noticing small details and otherwise picking up on things that a mere mortal would have missed. At Storyteller discretion, a wraith can roll Perception + Alertness (difficulty 5) to pick out a detail that otherwise might have escaped them. Note that heightened senses can have a drawback. They can be overwhelmed by an excess of stimulus, causing the wraith severe discomfort (though no actual Corpus loss). Perhaps the defining trait of a wraith’s existence, Insubstantiality is both a blessing and a curse. With a minimal expenditure of Corpus a wraith can walk through walls – or bullets, but without the help of Arcanoi the simplest touch into the Skinlands is beyond them. Missed out on the Kickstarter, so very much looking forward to the PoD! Did the superfluous Dodge skill get removed? Dodge has been removed and replaced by Athletics in all instances. We have a new Talent in its place. Any chance at all we might see this go up for sale on DtRPG next Wednesday (7/11)??? I submitted about 20 pages (give or take some) of errata. None of that included these omissions. I’m super-glad it’s gonna be in the book!